From a 5-star review: “What is the purpose of the church? Why does she exist? 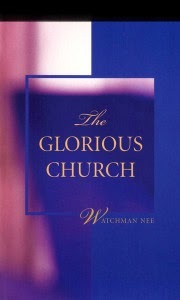 Watchman Nee answers these questions thoroughly by showing us four types of the church in the Bible. And it's good news, because the church truly is (and will increasingly be) glorious! God's purpose is to gain a group of people who are like Christ! Nee begins with a description of God's plan for man, and why man was created. We're shown comprehensively that man was created to have dominion in this earth, including over Satan! Unfortunately, man fell from his original calling. However, Jesus came, and Satan had nothing in Him! God's plan is still the same for us, to have dominion, and we can do that through Christ. He then continues with Eve, a type of the church. This is a beautiful type. Just as Eve was wholly out of Adam, so the church is wholly out of Christ. The church is not composed of many individuals from various places, the church is Christ, Christ in you and Christ in me. Next the bride in Ephesians 5 is scrutinized. Here we are told that Christ loves and cherishes His bride, washing her with the washing of water of the word! Here I hope you will realize, as I did, the privilege we have to be nourished and cherished by Christ! He examines two more types, the man child in Revelation 12, and the New Jerusalem found in Revelation 21 + 22.